The story is based on an young man (played by Girish Kumar) who falls in love with Shruti Haasan, who lives on the fields of Punjab. He follows her to her farm, where her elder brother (Sonu Sood) challenges him to produce more seed on their fields. If he wins, he will be allowed to marry her. 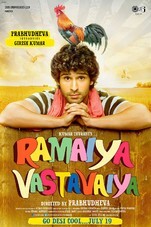 Ramaiya Vastavaiya is a remake of Prabhu Deva's directorial debut Telugu blockbuster 'Nuvvostanante Nenoddantana'.